Tyler is 6 (almost 7) weeks old! He was 9'13 lbs and 21 inches long when we went to the doctor this past Thursday. His birth weight was 6'15 (19.5 inches long), so he has been growing like a champ. He is taking about 4 oz of formula every 3 hours. At night, his 'bedtime' is 9pm. We feed him at 9... wake him at 10:30 for a dreamfeed... then we let him sleep until he wakes up or we get him up at 6am to eat... then back to bed until 9am which is what I like to call his morning wake up time officially. 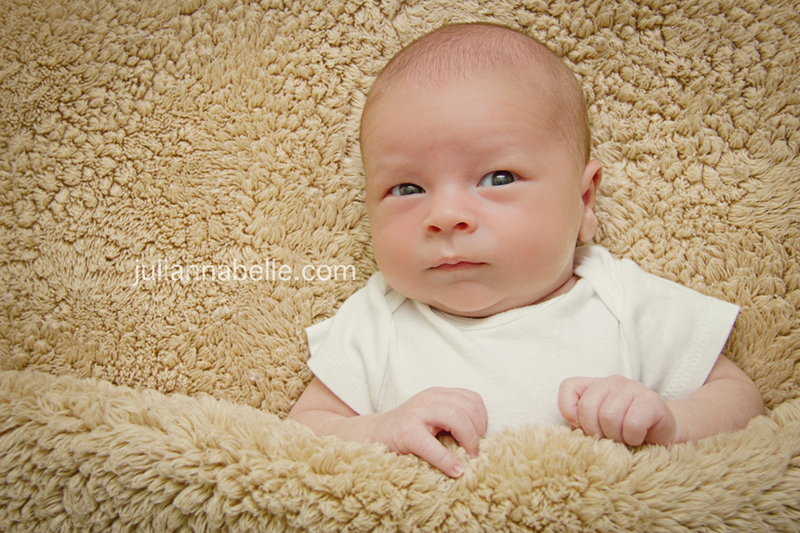 Julianna slept through the night by 7 weeks (11-6), and he's following in her footsteps. In the last week, Tyler is really alert & paying attention to everything around him. He is batting at toys and really reaching out for things with his hands. He also gave us a smile a few times! He is on a very predictable schedule (very good for us too!). I'm still trying to get his naps right during the day. He is a light sleeper for some naps and he has a hard time napping in his crib sometimes for whatever reason. I know this will straighten itself out, but for now, it's a lot of work for me. Thank goodness he sleeps better at night! He also naps well if we are out doing things... just not napping well at home. ha! Julianna is interacting with Tyler much more in the last week. She likes to give him his binky and 'check' on him to make sure he's ok. She is slowly warming up to him now that she knows he's not going anywhere. She includes him when she's talking about "us" as a family - which is very cute to hear her talk about him. So originally the plan was to not go back to the cardiologist until December. That changed almost immediately. His arms & legs started quivering when he got hungry, excited, etc... I called the pediatrician, who then had me bring him in. Every little thing makes you worry when you have a child that has been through such major surgery & has a congenital heart defect. The pediatrician ordered bloodwork & sent me to see the neurologist (immediately) later that afternoon. The neurologist did some basic tests & said the same thing the pediatrician did - The random tremors were just a normal 'baby' thing they called baby quivers. It was not seizures or brain related issues from the surgery. They explained that if you are on bypass, you can have brain related issues (seizures,etc) apparently. However, to be 100% certain, the neurologist ordered more bloodwork in addition to what the pediatrician asked for. I then drove from the neuro's office directly to the hospital where Tyler was born to get the bloodwork done (the children's hospital is there - and so is his cardiologist) - They wanted him to go to the hospital because they needed the results ASAP... and it was a better equipped facility than a "blood lab" to get this done. It took an hour of pure torture to get the blood from Tyler because his veins were thin from surgery still. The ped, neuro and bloodwork were all in the same day. Poor kid. It was a LONG day for both of us. The bloodwork came back fine ... but the cardiologist called me to say she wanted to see Tyler for a follow up to make sure nothing else was going on. The day that I brought Tyler for his follow up with the cardiologist, he had blotchy skin and was kind of lethagic with his eating. Panic set in with me. Of course right away I think "Heart issue!" because every silly symptom now makes me paranoid. But the doctor said to never feel like I'm just being crazy thinking something is wrong - they all said make sure you call us even if you think it's nothing. Better to be safe than sorry. Hell yes. Another 3 hour appointment at the cardiologist. She noticed he had an "extra heart beat" or rapid beat every so often during the EKG and Echocardiogram. She was concerned so she sent him home with an EKG halter to wear for 24 hours. We returned to cardiologist the next day to have them remove the EKG leads, and read it on the computer. The cardiologist ordered more bloodwork (extra heartbeat can be caused by many things & they like to rule out everything else first). She called me that night saying the results came back OK except he is slightly anemic. Once they read the EKG, it also showed he had this 'extra' beat about 2% of the time... very typical for a baby who has had heart surgery like this. She said we need to watch it and he may need medication later on but she would consult with the other doctors there and let me know. Because of the anemia, I had to then follow up with the pediatrician a few days later. She said the low anemia is most likely something called "Nader" that all babies go through - they all get anemic at this point in their lives. The cardiologist thought the same thing but wanted to send me to the pediatrician to confirm that's all it was. The pediatrician ordered MORE bloodwork again. Poor Tyler. He just HATES getting his blood drawn. Who doesn't. This time it came back with some low levels of something (I can't recall the name) that showed he might be fighting off an infection or virus of some kind. She called me the next day and said I need to go to the ER to get his levels taken again because if it was lower, they would need to admit him because he would be too weak to fight off anything. REALLY??? Come on. Enough already. Tyler did not have a fever, so it was most likely not an infection... but we had to be 100% sure. At this point, I am SOOO sick of hospitals, doctors offices, copays & bloodwork. ARRGGHH!!!!! I know it's for his own good, and would never blow it off, but it's frustrating to say the least. With that said, his docs have all done a phenomenal job of following every symptom and making sure everything is looked at- you can't afford to overlook one thing with his condition. So... off we went to the ER. Brian met me there since Julianna was home with me - no way could I deal with her in the ER and Tyler alone. The did an echo & EKG there... & more bloodwork. Our cardiologist was not on call, but someone else that works with her looked at Tyler for us. She said Tyler had to be put on "Digoxin" starting now - for his 'extra' rapid heartbeat - I think it's called Chronic Atrial Fibrillation. It would be REALLY nice to go a week without a doctor or hospital visit and/or bloodwork. These visits are mentally & physically draining between the driving, the time, the planning for both kids, the copays & the uncertainty every time I go and find out something new is wrong, and being shipped off to another doctor right away. I haven't once asked "Why us?" or "Why Tyler" during this whole ordeal - you can't think that way and you certainly can never plan for something like this in your entire life. However, I just want everything to settle down & be normal. I want Tyler to be a happy normal baby. I sometimes watch him breathe, and start making myself nuts thinking "Is he breathing too fast? Is his skin turning blue?"... your mind plays bad tricks on you... and then you snap out of it & realize he is just fine. Hint... they are going on his birth announcement, which I already ordered & stuffed them in the envelopes... but they've been sitting on a table for about a week now! I have to find the time to address them... *SIGH* !! He is beautiful Skye. I know it is alot on all of you right now. Praying the DR's visits get less and less soon. Praying for complete healing! Praying for Mommy and Daddy to feel comfort. Jeremiah 29:11 For I know the plans I have for you," declares the LORD, "plans to prosper you and not to harm you, plans to give you hope and a future. Thanks for the update I've had Tyler, you and your family in my prayers. He is such a cute little guy. Love your blog!